There are several different 8 quart chafer dishes that are manufactured by DWL industries, also known as WINCO Manufacturers and Imports. The company makes and sells a variety of kitchen and tableware for restaurant use. By many of the products manufactured by this company are purchased by individuals to use for large family gatherings or parties. However, individuals can’t buy directly from the company and WINCO only sells to suppliers. 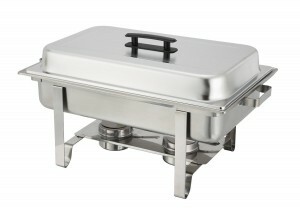 The Winware 8 QT Stainless Steel Chafer is a full size chafer used by many restaurateurs and caterers when they need to serve hot food buffet style to large a number of people. This chafer dish holds between 25 and 30 servings. The Winware 8 Quart stainless steel chafer is not a chafing dish that has all the bells and whistles. Instead, it depends on quality and functionality, and has just the right features to make this chafer useful for a variety of different functions, from casual buffets to formal affairs. The Winware 8 quart stainless steel chafer is a nice looking chafer. There is nothing fancy about it. However, the stainless steel looks great with any type of table setting and serving dishes, and the 2 ½ inch deep full size pan will hold plenty of food for a large group. Reviews for the Winware 8 QT steel chafer are excellent, with this serving dish earning impressive feedback from customers. While most people felt that this 8 quart steel chafer is a high quality chafer, one or two customers expressed some disappointment that this chafer was not of the quality they expected. But overall, the majority of customers were delighted with this chafer and felt it met their needs perfectly. The Winware 8 Quart Stainless Steel Gold Accented Chafer is the exact same chafer with the exact same features as the Winware 8 quart stainless steel chafer, with the exception that this chafer has gold accents on the legs and handles. The Winware 8 quart Stainless Steel Gold Accented Chafer appears to be every bit as functional and polished as the Winware Stainless steel Chafer, although the gold accents on this chafer gives it a bit more flash for those more formal occasions. This chafer scores high marks from customers on reviews across the internet. One customers felt that this chafer had a dull finish when compared to the 6 quart chafers by the same company. Overall, customers really like this chafer and find it perfect for larger gatherings. 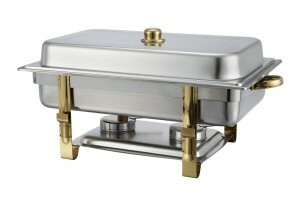 The Winware 8 Quart Stainless Steel Roll Top Chafer is both elegant and functional. The roll top lid on this chafer gives it an elegant look that would be perfect for entertaining friends, and for large family gatherings. This chafer would be perfect for a small catering business where you want your serving dishes to be functional and look elegant as well. Actual customers certainly like the Winware 8 quart stainless steel roll top chafer as can be seen by the fact that they rated it so highly across the internet. Some customers do feel that this chafer is too heavy for their purpose as this chafer does weigh over 10 pounds. Overall, this chafer did the job people expected it to and did it well. The Winware 8 Quart Stainless Steel Roll Top Chafer With Gold Accents is the exact same chafer as the Winware 8 Quart stainless steel roll top chafer, with the exception that gold accents have been added to give this chafer a more high end appearance for catering those special occasions or dinners. For those who want a chafer with a more elegant look, the Winware 8 Quart Stainless Steel Roll Top Chafer with gold accents should fit the bill. It is plenty large enough to feed a good size group, and the gold accents and the roll top lid give it a quality look. The reviews for this Winware chafer are excellent with customers giving it very impressive feedback. Customers were delighted with everything about this chafer, and found that it made catering for large groups really easy. They especially loved the quality of the chafer and felt it was well worth the price.